Plymouth Argyle strolled to a comfortable victory over the Grecians at Home Park in City’s first away game of the season. After Liam Sercombe had a decent looking appeal turned down by referee Roger East in the opening stages, the hosts soon took the lead. Tyler Harvey placed a free-kick into the top left corner and past young Christy Pym, who will be disappointed to have been beaten at his near post. City struggled to create chances due to their narrow 5-3-2 formation, in which Craig Woodman and Danny Butterfield were deployed as wing backs, and not long later Argyle doubled their lead. The hopeless Butterfield lost possession just inside his own half and when Reuben Reid was sent clear on goal the forward made no mistake – slotting past Pym to put the hosts in total control. Paul Tisdale shook things up at half-time, ending Butterfield’s misery by replacing him with David Wheeler. New signing Graham Cummins was also introduced in place of Jordan Tillson. The substitutes made an immediate impact as City controlled large parts of the second half, in particular young Wheeler who terrorised the Plymouth left-back. None of his teasing crosses were finished off by a teammate, however, with Cummins going close on a couple of occasions. Tom Nichols then failed to run off an injury suffered in a collision with an Argyle player – Ollie Watkins his replacement. 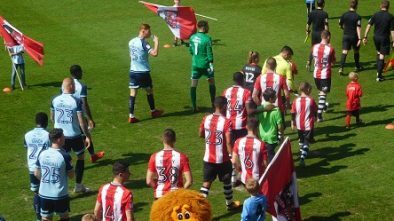 The Grecians continued to huff and puff without beating Argyle goalkeeper Luke McCormack – the target of some tasteless abuse in the second half – and the hosts wrapped up the match in the closing minutes. Christy Pym spilled a set-piece in to the path of centre-back Curtis Nelson, who smashed it in to send the home fans into raptures and the travelling Grecians in search of the exits. 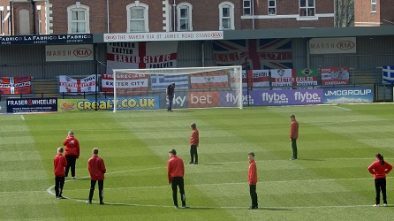 A forgettable day for the 943 that made the journey from Devon’s capital. Plymouth: McCormick, Mellor, Nelson, Hartley, McHugh, O’Connor, Alessandra, Harvey (Allen 76), Norburn, Banton (Thomas 85), Reid (Morgan 71). Exeter: Pym, Butterfield (Wheeler 45), Tillson (Cummins 45), Bennett (c), Baldwin, Woodman, Sercombe, Oakley, Grimes, Keohane, Nichols (Watkins 74).